Beyond an endless supply of Minority Report and Iron Man references, the Leap Motion gesture control sensor provides the world with a new way of interacting with games, apps, and even robots. Been wanting to check it out? Kotaku readers can now get almost 27% off this Leap Motion Bundle. 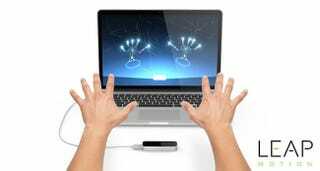 In case you're not familiar with the Leap Motion, it's a USB sensor that allows you to control all sorts of on-screen stuff just by moving your hands, similar to Xbox's Kinect. New apps and games are constantly being added to Airspace (Leap Motion's App Store), but you can already use the device to do all kinds of things like explore the globe, play games, and edit photos.. It's cool and futuristic, but it's actually fun and useful, too. As a starter kit, we've bundled the Leap Motion with $20 of Airspace credit, and knocked 27% off the total price — this slice of the future is now $79.99. Check below for more details.